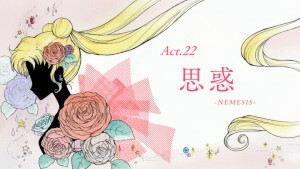 The next episode of Sailor Moon Crystal, Act 22, Hidden Agenda – Nemesis, will be available this coming Saturday May 16th. The episode will be available to stream on Crunchyroll, Hulu and Niconico starting at 7pm Japan Standard Time which is 6am Eastern Time and 3am Pacific Time. 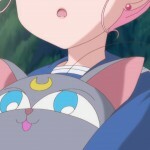 Chibiusa has disappeared but we won’t be seeing what has happened to her this week as we focus on what’s happening on Nemesis with various kidnapped people. Sailor Moon, Sailor Mercury, Sailor Mars and Sailor Jupiter are still prisoners on Nemesis. With this we will get a bit of backstory about the Death Phantom also known as Wise Man. 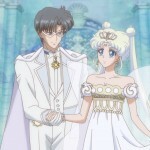 With Chibiusa gone Tuxedo Mask chases after her leaving Sailor Venus to hold down the fort and the kidnapped Sailor Guardians to save themselves! 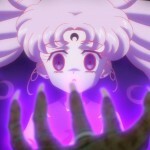 The end of the last episode teases us with Black Lady but we won’t be seeing her this week. We will only be seeing a sort of proto Black Lady without her iconic black and pink dress. 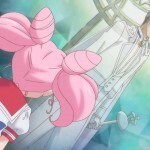 In the next episode preview shown at the end of Act 21 we once again see Chibiusa wearing the wrong school uniform! 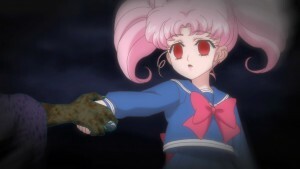 Chibiusa has two school uniforms. She came from the future wearing a long sleeved blue uniform but once she started school in the past she switched to a short sleeve white uniform. That is what she is wearing when she takes Wise Man’s hand at the end of Act 21 so why is she wearing her older long sleeved uniform in the next episode preview? 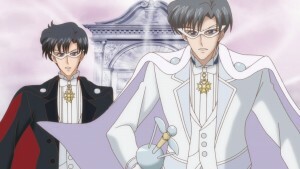 Earlier mistakes with the uniform colour have been corrected between the next episode preview and the actual episode. It is expected that the same will occur here though we won’t know for sure until Saturday. 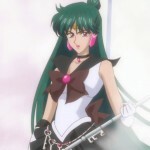 This entry was posted in Pretty Guardian Sailor Moon Crystal (2014) and tagged Black Lady, Sailor Moon Crystal Act 22 - Hidden Agenda – Nemesis, Sailor Moon Crystal Phase 2 - Black Moon, Wise Man by Adam. Bookmark the permalink. I get to see Sailor Moon, Mercury, Mars, and Jupiter again after not being transformed. Yay! This is my ‘Crack cocaine’, can’t wait for the next hit! Well, at least it’s not CRYSTAL meth. I can’t wait. I always loved Saphir’s character in the first anime and his manga self is much more prone to darkness and brainwashing. He was one character I felt like the first anime did better than the manga, even if he could have used some more fleshing out. I did like how the recent musical took Saphir’s character though i doubt Crystal will be as dark as the new Seramyu went.